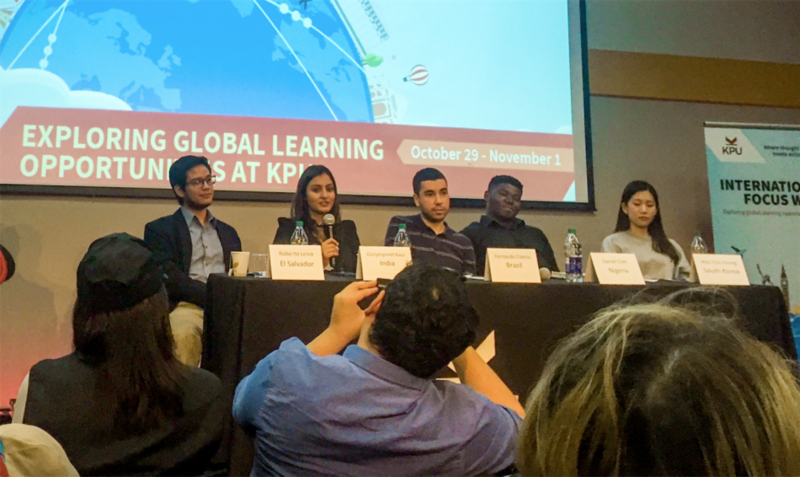 Five of KPU’s international students spoke as part of a panel discussion at the Surrey campus on Oct. 31. The discussion centered on each student’s unique experience coming to Canada to study. One key takeaway from the event was that the panelists—each from a different country—were drawn to Canada because of its diversity. Most of them had heard that it was possible to feel accepted in Canada due to the many cultural communities already established here. The panelists also spoke about the challenges they have faced studying abroad. One panelist, Heo Yun Young, said she had a difficult time reading and writing in English, and like many international students, had to work on her language skills every day. Fernando Cilento, a panelist from Brazil, feels that instructors should check in with international students more often to help them adjust to their new life in Canada. Like Young, he believes that many international students may not feel comfortable in class because typically they are not wholly familiar with the language in which they’re being taught. Arshdeep Boparai, an international student from India who attended the panel, echoed Cilento’s point. She feels that both instructors and students should make an effort to help international students feel more welcome in the classroom. Although she enjoyed her first two years at KPU, she also has a hard time affording the high cost of tuition while still achieving good grades in school. Another panelist, Gunjanpreet Kaur, spoke about how, after she arrived in Canada, she was “totally by [herself] and had no contacts and no relatives” to make the adjustment easier for her. This struggle was difficult for all the panelists, and they predict that the same is true of many other international students. Roberto Leiva, too, talked about his struggle with being alone and about overcoming certain difficulties without the support of another person. Through this, he says that he “learned more about [himself] and others” and is still “widening his perspective” on all aspects of his life. Another major concern mentioned at the panel was the financial pressure that international students feel when paying for tuition at KPU. Cilento addressed this issue as being “the biggest challenge for [him] and probably a lot of [international] students.” He says that he “really admires international students” because of the sacrifices that they make to be at KPU, adding that “families are struggling as well” to support their kids financially.